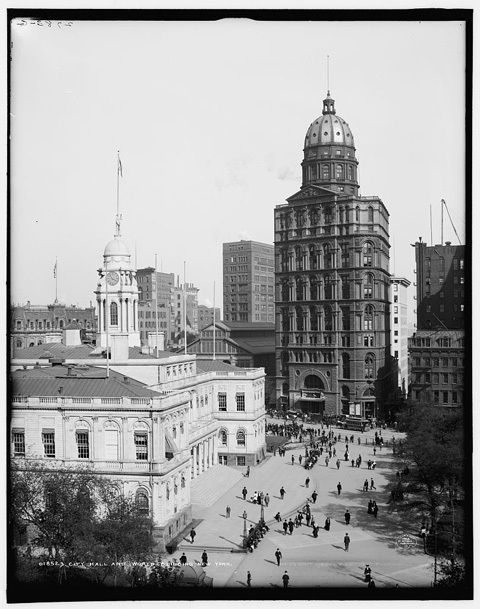 City Hall and World Building, New York, 1905. Courtesy of the Detroit Publishing Co. Library of Congress Prints and Photographs Division. At 309 feet to the top of its cupola, the New York World Building, completed in 1890, was the tallest skyscraper in New York-- and at that time, the world. The headquarters and printing plant of Joseph Pulitzer's newspaper was a Renaissance Revival tower across from City Hall designed by the prominent architect George Browne Post. Half of its 18 stories were occupied by the newspaper's functions and the rest were rented to other tenants. 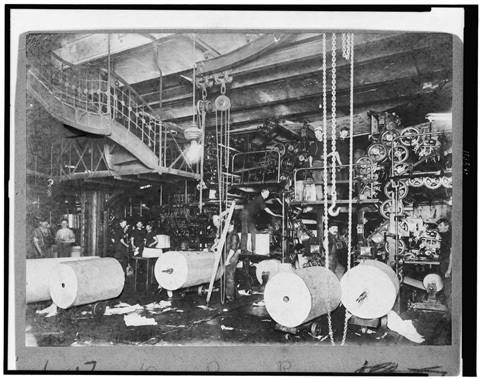 Daily editorial meetings with Pulitzer started under the tower's dome; staff wrote stories in the sunlit upper floors; production traveled down the building to the linotype composing room, finally culminating in the cellar, where giant presses printed 48,000 eight-page papers per hour. Paperboys waited on the curb to receive folded papers for delivery. The tower was demolished in 1955 to accommodate the expanded automobile entrance to the Brooklyn Bridge. Men Posed at their Workstations in the Old Press Room: in the Pulitzer Building. 1908 Courtesy of the New York World Telegram and the Sun Newspaper. Library of Congress Prints and Photographs Division.